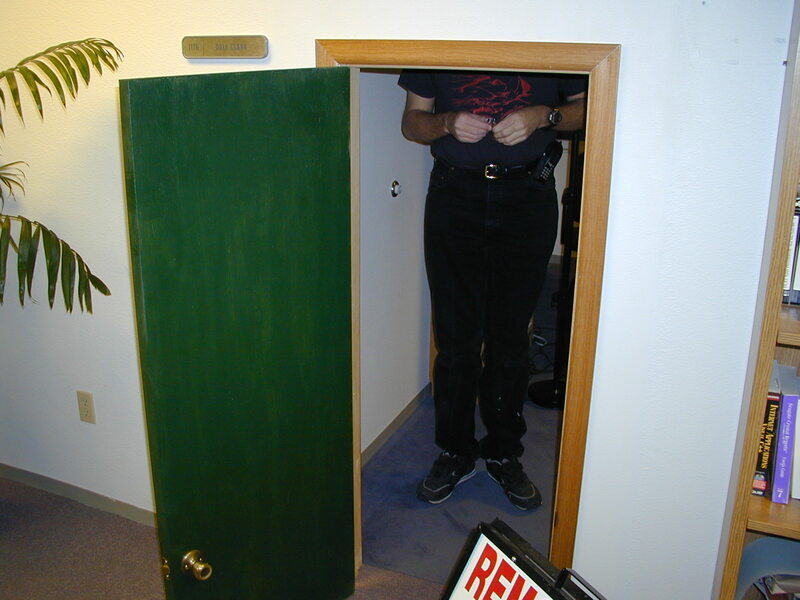 Since April fool’s day is coming up, I figured it was about time to do a post about the little door. A number of years ago, my boss foolishly decided to go on vacation. Since he was gone, the obvious thing to do was to replace his office door with something a little more interesting–or at least a little more little. Over the weekend, I press-ganged my wife and a number of the other developers to help. 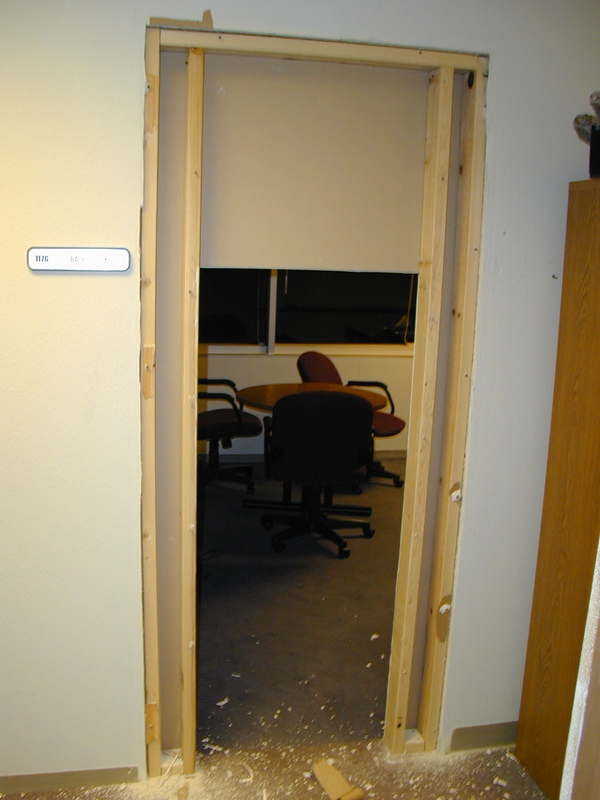 We removed the full size door and door frame, then framed and dry-walled in a new door. 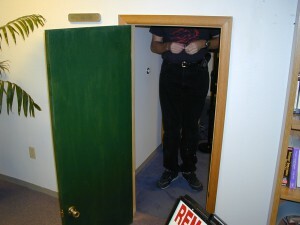 The new door was designed for a very narrow closet, and we also chopped a couple of feet off the bottom. You should get a good feel for when this all happened based on the size of the cell phone on my belt (and the really nifty digital watch). We were very proud of our workmanship, but the head of facilities was less impressed. He went completely nuts–almost cartoon-level nuts–turning red and screaming. 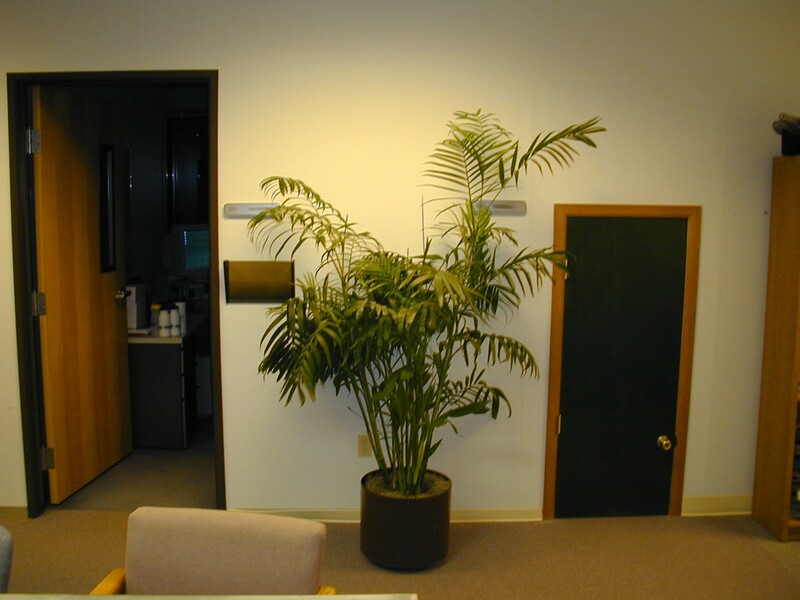 He dragged over the CEO du jour (at that point, the company changed CEOs about as often as I got haircuts), but fortunately that particular CEO had a good sense of humor, and thought the door was great. As for Dale, our boss–he walked in, stared at the door, then spun around and walked right out again, I think to avoid completely cracking up. He kept the door for almost a month–he said he liked the fact that everyone had to come into his office bowing. Funnily enough, Dale was in the navy, working on nuclear submarines, and I swear that he could go through the door without even slowing down. I think that these pictures were taken by my friend Maxx Daymon, or at least with his camera (he is in some of the shots).